Oh look, a crock pot! Phew, back in familiar territory. 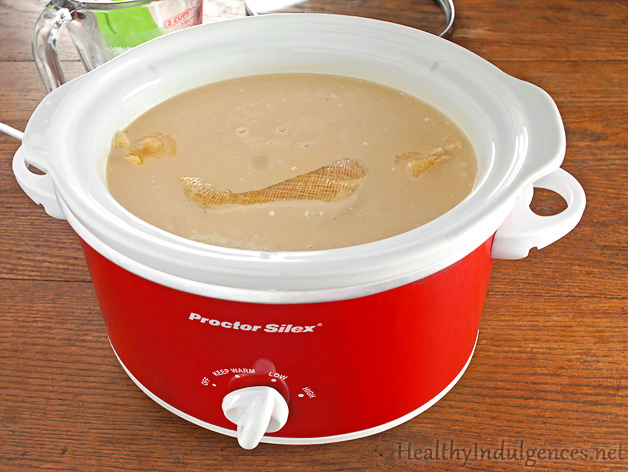 Set your crock to LOW for 1 hour to let the mixture come up to a safe temperature. Then, turn your crock down the KEEP WARM and steep the pumpkin pouch in a sweetened milk mixture overnight (recipe below). After 8-12 hours, the flavors of the pumpkin and spices will permeate the cream, flavoring it intensely without getting any bits of fibrous pumpkin pulp into the mix! Now, here’s the fun part. After 8-12 hours of steeping, turn off your slow cooker. Go do laundry, watch Netflix, or read about this sugar-free Pumpkin Gooey Butter Cake you should be making for Thanksgiving this year. Let the creamer cool to warm. You’ll want to wait until you can safely grab the “teabag” without burning your hands. Hold the teabag with both hands, and squeeze it gently but firmly, like you’re wringing out a sponge. Get out all of your rage and frustration from the week! 😀 If you secure the ends well with those metal twisty ties, you shouldn’t have any pumpkin or spice leaking out. I didn’t photograph this step because my hands were extremely goopy. As a finishing touch, use a blender to smooth out the creamer. You can pour the creamer into a standing blender if you don’t have a stick blender . If you don’t have an immersion blender, consider investing in one. They’re life changing. Optional step: Store your creamer in a colorful rooster-covered olive oil dispenser. 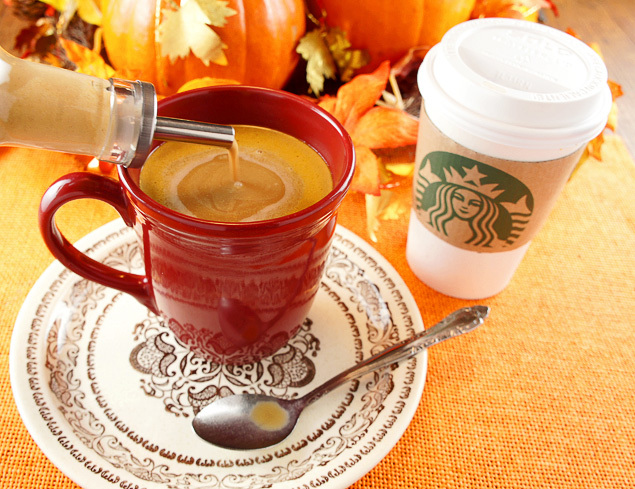 Your pumpkin spice creamer should keep in the fridge for 1-2 weeks… if it lasts that long! 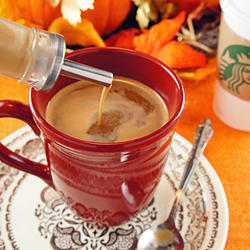 A home brewed Pumpkin Spice Coffee Creamer to get all of the taste of the Starbucks version without the sugar! Keep this creamer in your fridge, and add it to your coffee to make an instant latte before you run out the door. Add cashews to a high speed blender, and fill with water up to the 2.5 cup mark. Add coconut milk to blender, and cover with lid. Gradually increase blending speed until you reach the maximum power, blending for 1 minute. Scrape down blender, and blend again on maximum power for one minute, or until mixture is very smooth and creamy..
Add cashew-coconut milk and vanilla to crock pot, and set to LOW. Dampen the cloth your are using to make the pumpkin roll, squeezing it out to remove excess water. Set length of fabric on to a small plate, aligning it so that one end of it is centered on the plate. 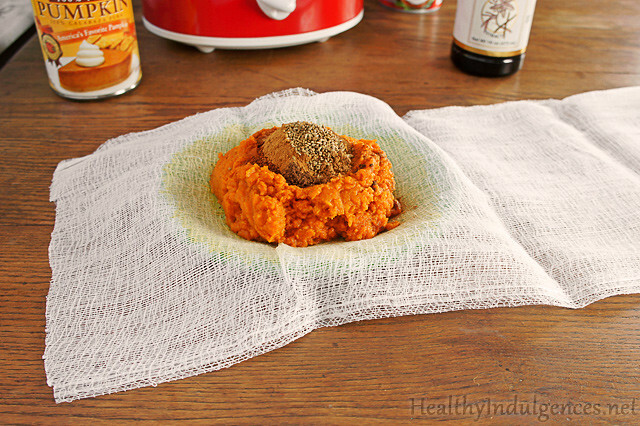 Place pumpkin puree in the center of the cloth, and make a well in it with the back of a spoon. Place spices in the well (should look like a spice volcano!). Roll up pumpkin spice roll, starting from one end and rolling to the other end. Secure ends with twisty ties. Open crock pot lid and add pumpkin tootsie roll to milk mixture, submerging it. Let crock pot cook on LOW for one hour. Turn crock down to keep warm, and let mixture steep overnight (8-12 hours). In the morning, turn off the crock pot and remove pumpkin tootsie roll to a plate. Once pumpkin roll has cooled to the touch, wring it out over the liquid mixture in the crock pot to extract the pumpkin essence! Squeeze as much liquid out of the pumpkin pouch as you can. Add sweeteners, and blend once more. Keep creamer stored in a glass jar or other storage container. It keeps well for 1-2 weeks in the refrigerator. *To make this paleo, you could use coconut sugar, honey, or maple syrup in this recipe if you like. I recommend starting with 1/2 cup coconut sugar and tasting the creamer. It should be sweeter than you’d like the individual latte to taste because it is a concentrated mixture. 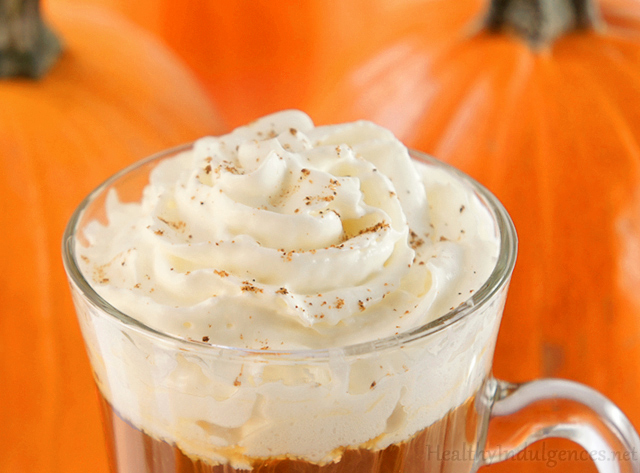 Keep in mind that honey has a taste that can overpower the pumpkin spice flavor. « Sugar-Free Pumpkin Muffins and Testing Stevias! O.k. Finally!! 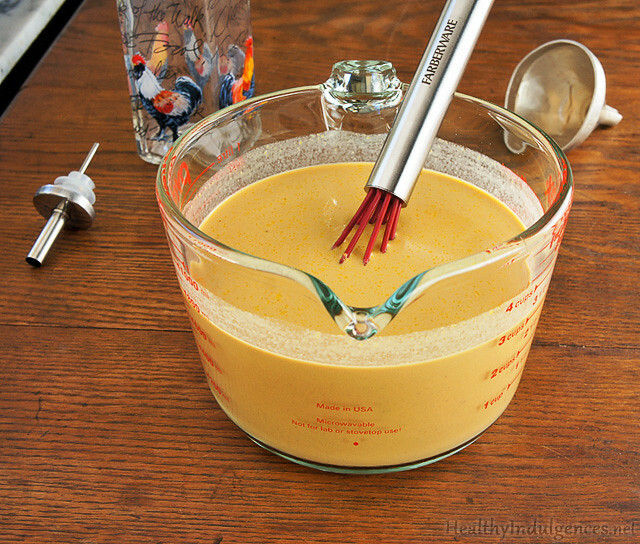 a pumpkin spice creamer recipe that looks like it might work! I’ve tried numerous ones that have always come up short. Either they were goopy or the spices stuck to my lips. I’ve finally resorted to sugar free pumpkin spice syrup, which I don’t really like using because it has Splenda in it. So I only allow myself to use it once a week. Can’t wait to try this! Twila, It will definitely work for you. I tested this recipes so many times that I can make it in my sleep. 🙂 I had the same issues as you did with other recipes. You will definitely appreciate the silky smooth texture of the creamer! Let me know what you think after you try it! Pumpkin juices are used for weight loss. Now only i heard pumpkin spice latte.Gonna to try this. Making this (paleo) today – can’t wait to see how it turns out! Susanne, how did it turn out for you? Maybe I did something wrong, but…I don’t seem to be able to get it smooth. Maybe it’s because I did the paleo version with cashew and coconut milk. It tastes good, but has lots of oily lumps in it. Also, I was making an iced latte, so perhaps that is the problem. Suggestions? Susanne, did you soak the cashews before making the cashew milk? I used a Vitamix to make the cashew milk, so it was extra smooth and silky. Also, did you blend together the creamer at the end with a stick blender? I’m so sorry to hear you had trouble with it! Please subscribe to the mailing list if you haven’t already, as I have a few more user-friendly pumpkin recipes coming your way. 🙂 thanks for taking the time to leave feedback, Susanne! 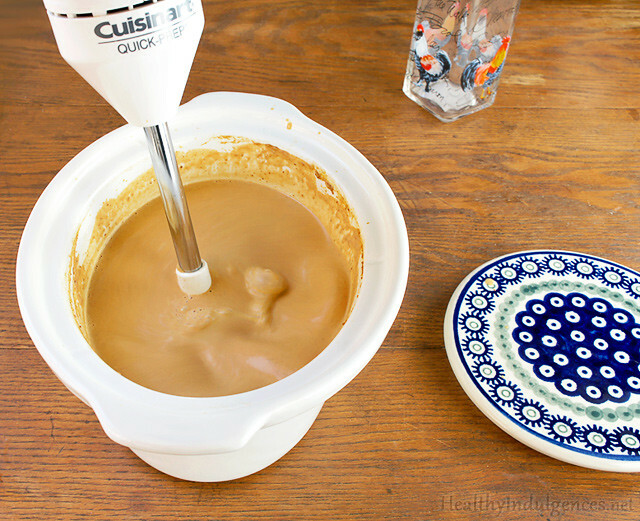 I did soak the cashews and I used my VitaMix to make the milk – and I have a stick blender. I followed the directions to a ‘t’. I look forward to more recipes! Susanne, I appreciate your comments. I will take down the dairy free version temporarily until I can work the kinks out! Just tried a second batch of the Paleo creamer. I’ll update the post after seeing the results! 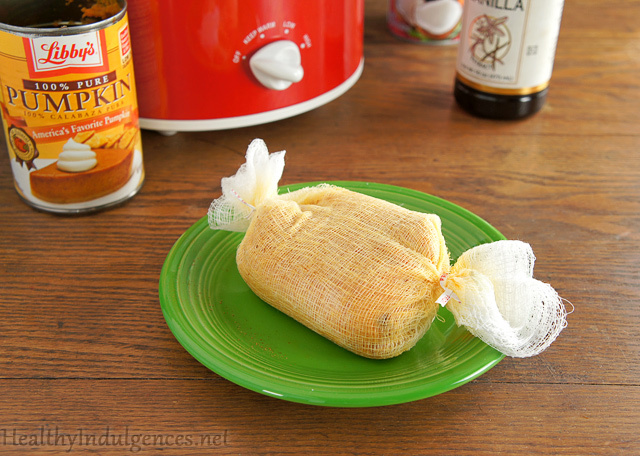 What can I use in place of cheese cloth? Dana, you can use a clean t-shirt. I’ve done it successfully that way multiple times! I put everything in the crock pot last night on low and was so excited to check it out this morning- only to find that the liquid had mostly boiled away, leaving behind a crusty, dark-brown top layer and a cottage cheese-like consistency underneath. I haven’t had the chance to run it through the food processed yet to see if it’s salvageable, but any idea on what went wrong? I’ve never had an issue with my slow cooker before, so I’m not sure what to think. Lauren (great name! ), I really appreciate the feedback. The only issue I can think of us that my slow cooker has different heat settings. Perhaps the temperature of the “low” and “high” differ from those of other slow cookers. I will check the temperature at time increments with a thermometer and update this post. Will take the recipe down until further notice. So sorry you experienced an issue with the recipe! Hi, Lauren, I wanted to ask if store bought cashew milk would work instead of making it myself since I don’t have a blender. Or is there another option? What size is your crockpot? Looking yummy and delicious. I didnt know this can be made like this. I am going to try this for sure. I never even look at expiration dates. They're so inaccurate I consider them meaningless. My roommate, on the other hand, obsesses over them. I eat very little packaged food, however, except that which I've canned myself. Hi! A couple of questions, at what step in this process is the salt supposed to be added? (I know it’s considered a spice, but it’s listed with the blender ingredients) and are the cashews to be soaked beforehand? If so, is this to make them easier to blend? Add a bit of instruction on that if you would! Thanks so much!! I recently started a new project on the web and really lack content since this is my first go around. As ideas come to mind I check if Im in compliance of Google. Thanks for the article it gives me that much further information in growing and marketing my network.